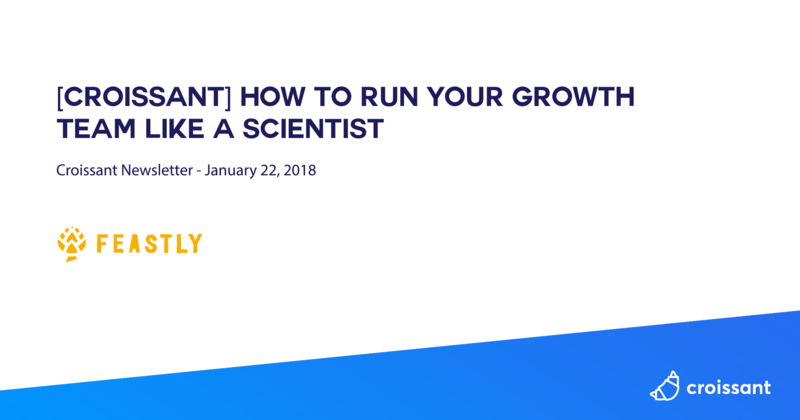 This week, a new article from the Reforge team on using the scientific method for growth, a few product oriented articles, one great resource on SEO by Brian Dean and a great opinion post on Mark Zuckerberg FB feed conversations focus announcement. "Recently, a colleague was telling me about a “successful” experiment they were excited about. They hypothesized that the best time to encourage users to upgrade from a free trial was while they were using a certain common feature. To test this they put a big button on that page and saw a measurable lift in conversion compared to users who didn't see the button. Based on this result, they were attempting to drive more free users to that feature. I asked if they had experimented with putting the same button on other commonly used features, and they hadn’t. They hadn't controlled for the risk that the lift was simply a result of putting a prominent CTA in front of more users. This was especially concerning given that they were funneling resources into more projects based on the assertion that this one feature is important for activation. It was apparent they just didn't understand how to design proper controls to prove their hypothesis." 2. They’ve realized they can’t afford it. Their initial experience lacked value. This might mean that they couldn’t figure out how to use the product, didn’t understand how to get the most out of it, or it wasn’t immediately obvious how the product fit their needs." "The best analyses combine quantitative and qualitative research to create a flywheel of continuous product improvement. You use quantitative information to focus attention on the biggest problems (and opportunities) and then "zoom in" to the level of the user through qualitative research to round out your understanding—and solve the problem. "This is the ultimate guide to dominating Google’s search results in 2018. And let me be clear about something: This is NOT a lame “SEO in 2018” predictions post. Instead, you’re going to see tested strategies that are working right now…and will work even better in 2018. So if you’re looking to up your SEO game this year, you’ll love this guide. Let’s dive right in. "I’ve yet to see a better way to build loyalty or engender trust in a target market than by teaching them. For example, Joanna is very skilled in copywriting, so she teaches: How to write better emails that get more opens and more clicks How to write landing page copy How to do review mining of Amazon to help you create your messaging Copywriting tricks and other things to keep in mind The Tuesday Tutorials are a good example. Joanna uses Airstory when she teaches, so people who see the tutorials are constantly asking “What’s Airstory? How can I get using Airstory?” And the follow-up conversations are helping to build the business. Here’s something else that’s been really helpful. "When content impacts people on a personal level and gets them talking, well, that’s how change happens. “The research shows that when we use social media to connect with people we care about, it can be good for our well-being,” Zuckerberg said in his Facebook post. “We can feel more connected and less lonely, and that correlates with long term measures of happiness and health. On the other hand, passively reading articles or watching videos — even if they’re entertaining or informative — may not be as good.